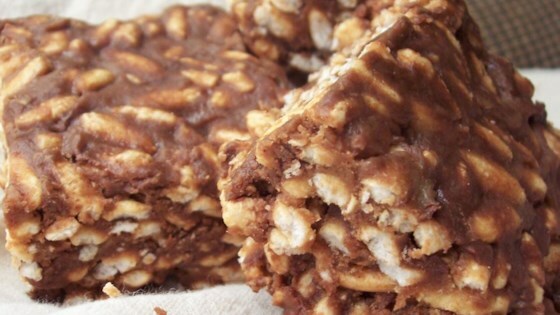 "Like the crispy rice treats, but with chocolate chips and peanut butter." Butter a 9x13 inch pan. Pour the sugar, syrup, and peanut butter into a large microwave bowl. Microwave on high until it begins to bubble, two to three minutes. Once the mixture is boiling, remove from the microwave oven, and stir in the cereal and chocolate chips until coated. Pour the mixture into the prepared pan. Wet hands, sling off the excess water, and press down the treats until smoothed. Let cool, and cut into squares. Rich, tasty, easy to make! I have made this recipe twice now..everyone loves it. I made it out of special K cereal and I melted extra choc chips with a bit of milk and sugar and spread it over the bars. yummy!!!! my daughters and I just made them----so easy! !